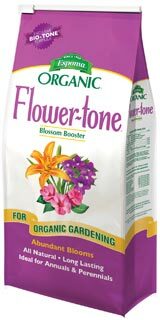 Yesterday I was out fertilizing my hydrangeas and roses and I got to thinking about how steadfast I am about this product line. I'm including pictures and links to make it easy to identify the products. I had always seen it at my local garden center but up until then I always used products like RapidGro liquid or MiracleGro fertilizer so I decided to give it a whirl. Their products are natural and organic and it breaks down in a slow gradual way that provides a safe, long lasting food reservoir for the plant throughout the growing season. 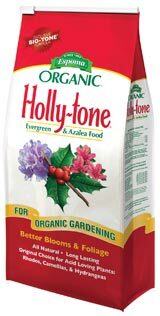 which is good for azaleas, rhododendrons, holly's and hydrangeas. 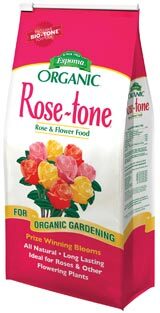 My roses were treated to their Rose-Tone product also. I have a very alkaline soil so decided to try the soil acidifier to see if I'd get more blue coloring. I had a range of pink, lavender and blue last year on my Endless Summer hydrangeas. Notice the rich heavy leaves on the plant too. The plants are really healthy. The Limelight hydrangea is my other favorite and I was real pleased with it's growth last summer. This was a newer one I put in the year before called CityLine- Venice. It's a short compact pink hydrangea. I have more but I better stop before you fall asleep!! Picking the right location makes a difference and keeping them watered does too. They definitely react to the heat and wilt easily. A lot of garden centers carry them, but my favorite is this handle with the easy grip and lever actived handle. I bought one version with a shut off valve rather than the lever type and didn't care for it. These provide a very full but gentle rain that can't be beat. I like this 16" version but there is also a 30" version if you prefer a longer reaching one. At the end of the season I snip off stems of the hydrangeas- once they are what I call "past perfect" and starting to get that paper look. I set them in water for a few days, and then let them dry out. If you pick them too early the flower will shrivel and won't be good for drying. Annuals are hungry little guys! Thanks for stopping by and I hope I provided some useful information for you! I love Limelight also. My very fave, and am spoiled because I compare everything to it. Your Hydrangea's are gorgeous. Liz, thanks for sharing this. I'll be on the lookout for these. Your hydrangeas are gorgeous!!! Liz, your hydrangeas are always stunning! I love seeing them and look forward to seeing more of your photos...you can never show too many! Glad to hear about this product because it certainly seems to work for you. I just found your blog and think it is amazing! Thank you for the fertilizer tip. Your flowers certainly look healthy. I just joined to be a follower of your blog and hope you will do so for me. I have lots of gardens to share when the weather warms up a bit. Gorgeous post. I'm pinning several pics. I had no idea you had 2 blogs. I don't know how you find the time but they are both wonderful. Wish me luck with my blooms this year! so jealous of your hydrangeas. I can't get mine to grow...they've been in the ground for several years and are still the same size. My next door neighbor has some that are amazing...same amount of light that I have. I don't get it. My azaleas don't grow either. 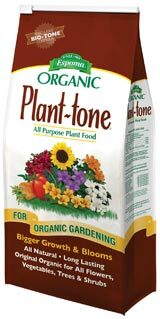 I'm using that brand of organic fertilizer in my veggie garden. are saying it. You're making it entertaining and you still care for to stay it sensible. I cant wait to read far more from you. That is actually a great site.